Citation: C N Trueman "Guy Fawkes"
Guy Fawkes is the name most associated with the 1605 Gunpowder Plot – the attempt by Guy Fawkes and others like Thomas Wintour, Everard Digby and Thomas Percy to blow up the king, James I, and members of Parliament. Guy Fawkes was literally caught on the spot and a ‘guy’ is still burned on bonfires – lit to celebrate the ‘miraculous’ survival of James I. Guy Fawkes was born on April 13th, 1570 at Stonegate in Yorkshire. Fawkes was the only son of Edward Fawkes and his wife Edith. He went to the Free School of St. Peter’s and among the other pupils there were Christopher and John Wright. Fawkes was tutored by John Pulleyn who some at the time believed to be a Catholic. As with so many ordinary people living at this time, the early years of Fawkes are clouded with mystery. If he had not found fame or infamy in 1605, few would have been bothered. There are some secondary sources that state that Fawkes married a Maria Pulleyn in 1590 – but the information for this did not come from parish records so such claims are open to dispute. It is also thought that Fawkes found employment as a footman – his employer was Anthony Browne, 2nd Lord Monteagle. It is thought that Guy Fawkes left England in 1593 or 1594 for Flanders. Here he joined the Spanish Army, which at the time was under the command of the Archduke Albert of Austria who later became governor of the Netherlands. Fawkes clearly impressed senior officers in the Spanish Army. In 1596, the Spanish took Calais and Fawkes held a position of command during this campaign. Fawkes was described as a man of “excellent good natural parts, very resolute and universally learned.” Other references refer to Fawkes’ “virtue” and “nobility”. Others noted his religious devotion and his punctual attendance at religious ceremonies. By around 1600, Fawkes was using Guido as a Christian name instead of Guy. In 1603, Fawkes left Archduke Albert’s forces and was granted permission to go to Spain. Here he wanted to enlighten Philip III as to the true standing of Catholics in England. While on this visit he met up again with Christopher Wright. It is believed that the two spent time devising a plan for a Spanish invasion of England on the death of Elizabeth I. However, any chance of Spanish support for such a venture was minimal as the Spanish were still very much affected by the disaster of the 1588 Spanish Armada – a calamitous defeat that had left deep scars in Spanish society. From Spain, Fawkes went to Brussels. Here he met Thomas Wintour (Winter). 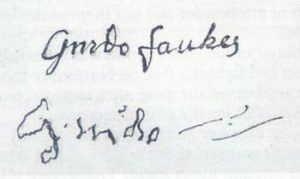 In his signed confession after his arrest, though it was signed under the duress of torture, Fawkes claimed that it was in Brussels that Wintour told him of his intention to kill James I. By May 1604, Fawkes had met up with Thomas Wintour, Christopher Wright, Robert Catesby, John Wright and Thomas Percy. They are said to have taken an oath at the Duck and Drake inn in the Strand in London that was to lead to the Gunpowder Plot. The Jesuit priest, John Gerard, sanctified the oath in another room at the inn. Now Fawkes became ‘John Johnson’ who was the servant to Thomas Percy. Probably in March 1605, the conspirators hired a cellar beneath Parliament. The cellar, on the advice of Fawkes, was filled with barrels of gunpowder that were hidden beneath iron bars and faggots. Fawkes returned to Flanders possibly to let the relevant parties know how far advanced was the plan. In August 1605, Fawkes returned to London and he went to the cellar to check on the gunpowder that had been stored there. The 18th October 1605 is a crucial date with regards to the conspiracy. The plotters met on this day. They discussed how Catholic peers might be spared from the planned explosion. This led to the famed ‘Monteagle Letter’ written in October 26th to William Parker, the 4th Baron Monteagle. A number of the conspirators were concerned when the contents of letter became known. However, they believed that the letter was so vague that they could continue with their plans. On October 30th 1605, Fawkes once again inspected the gunpowder stored in the cellar. On November 3rd, the conspirators met in London – though not Fawkes – to make plans for what should happen after the explosion. All of them made plans for a speedy exit from London. Fawkes was due to flee to Flanders after the explosion having set a slow fuse. On November 4th, the cellars of Parliament were searched. The Lord Chamberlain, Thomas Howard, Earl of Suffolk led the search party. They found Fawkes and decided that he was a “bad fellow” and reported their findings to James I. The cellar was searched again. Between both searches, Fawkes had left the cellar to seek out Percy to warn him about what had occurred. Fawkes then returned to the cellar. It was during the second search that Fawkes was found again in the cellar. Fawkes was arrested. On him, the arresting party found slow matches and touchwood. Early on November 5th, 1605, Fawkes was questioned. One of his questioners was James I. Fawkes claimed that he was ‘John Johnson’ but he made clear his real intention when he said that he wanted to blow a Scotsman back to Scotland. Fawkes broke his silence on November 7th. He confessed that he was Guy Fawkes and that five men were involved in the plot. On November 8th, he gave an account of how the conspiracy was to progress and on November 9th, he named the other conspirators. No evidence exists as to what tortures were used on Fawkes but it is generally accepted that the torture that most broke him was the feared rack. The trial of the conspirators started on January 27th 1606. There was never any doubt that those arrested were guilty. On Friday 31st 1606, Fawkes was taken to the Old Palace Yard in Westminster – he had been sentenced to be hung, drawn and quartered. He was meant to be the last of the conspirators to be executed. It is generally accepted that Fawkes escaped the butchery of this by breaking his neck during the hanging process. While the process of drawing and quartering was carried out, Fawkes was dead. He was to go into history as the man who tried to bring down a monarchy. Every November 5th, people in England are asked to “remember, remember, the 5th of November, gunpowder, treason and plot.” Effigies of Guy Fawkes are burned throughout the land, and in Lewes, East Sussex, an effigy of the pope is traditionally burned to further remind people of the Catholic aspect to the plot.